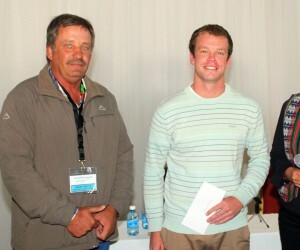 Gerrit “Mot” van der Merwe has been awarded the Hortgro Science Award as the best final year student in Horticultural Science at Stellenbosch University. He received the award at the recent Hortgro Science Technical Symposium, where the latest research news in the horticultural industry was shared. Van der Merwe was also one of the presenters during a morning session on the role that mechanisation can play in ensuring efficient farming practices. Van der Merwe, who hails from a fruit farm in the Koue Bokkeveld near Ceres, is furthering his studies and working towards his MScAgric in Horticultural Science. He is investigating whether the use of platforms and harvest systems under South African conditions can make farming practices more efficient, and how they are helping to create better working conditions for workers. His project is funded by HORTGRO SCIENCE and is done under guidance of staff members Willie Kotze and Dr Wiehann Steyn in orchards in the Witzenberg Valley, the Koue Bokkeveld, Worcester and Grabouw area. Prof Karen Theron of the SU Department of Horticultural Science and Dr Jan Lombard of the SU Department of Agricultural Economy are his study leaders. “The platforms and harvest systems have not yet been tested in an ideal orchard which sports a uniformity of yield and tree size and therefore we do not yet know what the full potential is,” van der Merwe cautioned. However, his preliminary data indicates that conventional harvesting teams in South Africa can achieve the same productivity levels as with mechanised harvesting in South Tyrol. Platforms worked best for small jobs that normally require workers to frequently move their ladders. The summer pruning of nectarines saw the biggest jump in productivity, with an increase of up to 300%. The harvesting of plums trained to a fruiting wall was in one study done 40% faster with a single level platform. Van der Merwe says the use of the conveyor type harvesting systems in less than ideal orchards generally limits the movement and potential of pickers, with a much slower picking action noted compared to conventional picking. It is difficult for workers to adapt to different conditions within an orchard, such as the uneven spacing of fruit on a tree. Productivity is hampered when fruit is picked two at a time and placed on the conveyor belt. Therefore the use of equipment that allows workers to fully use their skills should rather be considered. According to Van der Merwe, many orchards are not yet suitable for the full-scale use of platforms or harvesting systems. Effort needs to be put in before certain tasks in an orchard can be mechanised. The use of a harvesting system generally did not decrease injuries to fruit. A decrease in stem injuries in pears was the only notable exception. Van der Merwe believes that further innovation in the design of special bin filling systems is needed, as this seems to be where most of the bruising occurs on more sensitive cultivars. In her presentation, the chair of the SU Department of Horticultural Science, Prof Karen Theron, noted that the Darwin mechanical thinner can do the job up to 50% faster in plum and nectarine orchards than when thinning is done by hand. The findings are based on studies conducted by MScAgric student Gielie de Villiers. Mechanical thinning had no negative effect on fruit appearance or tree health. “It is however not as selective as hand thinning,” Prof Theron added. Prof Theron advised that orchards should be well prepared and free of overhead obstacles to ensure the optimal and hassle-free use of thinning machinery. The correct tractor speed and rotor speed per cultivar can prevent over thinning and yield reduction. Other SU researchers who also presented their findings at the HORTGRO SCIENCE Technical Symposium included Prof Nick Vink, chair of the Department of Agricultural Economics, and Dr Cheryl Lennox of the Department of Plant Pathology. Prof Vink focused on the history and impact of increased wages in the fruit industry, while Dr Lennox highlighted ways in which infections and rotting of apples and pears being stored for extended periods can be minimised. 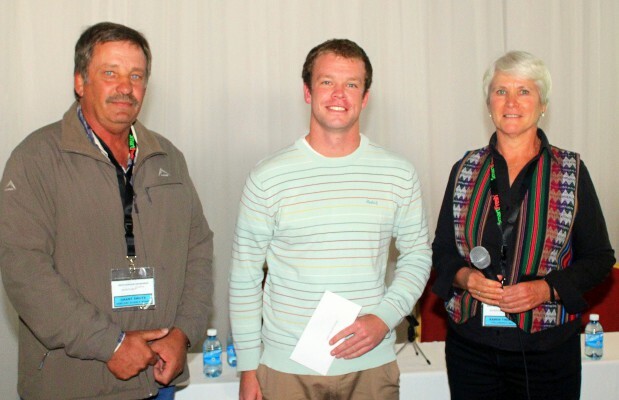 Gerrit van der Merwe received the HORTGROSCIENCE Award from Grant Smuts, chair of HORTGROSCIENCE and Prof Karen Theron, chair of the Department of Horticultural Science at Stellenbosch University.